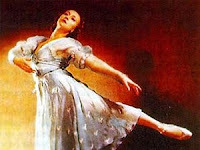 Russia Remember: Galina Ulanova – 100 Years! Russia’s major theaters are celebrating the 100th anniversary of legendary Soviet ballerina Galina Ulanova (January 8, 1910 – March 21, 1998). Tribute concerts will be held in St. Petersburg’s Mariinsky Theater and Moscow’s Bolshoi Theater. Read more about Galina Ulanova in Russiapedia (Galina Ullanova). This entry was posted in Memory, Theater on January 9, 2010 by admin.